I’ve always been a big fan of barbecue (heck, it is one of my top categories), but one of the drawbacks of living far in the Northeast is that almost nobody up here understands good BBQ. 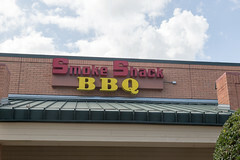 For every rare place up here that can make a decent barbecue with some tender texture, good moisture, and a nice smoke flavor, there are dozens that serve up truly mediocre barbecue, usually some sort of overcooked, tough meat (or even worse, boiled meat) served up with a cloying sauce. It’s happened to me enough that I treat any sentence containing both “New England” and “BBQ” in the same sentence with extreme skepticism. But when I’m traveling, it often gives me a chance to actually score some decent BBQ, since I can get down South where folks actually understand that “barbecue” means “smoked” and not “grilled” or “sauced”. Don’t get me wrong, it’s also important to do some research: the various BBQ regions of the US all have their specialties (Brisket and sausage in Texas, pork in the Southeast, and ribs in Memphis and St Louis), and that’s usually what they do best. So with that in mind, a recent trip to Daytona Beach had our group searching out lunch, and we decided to try out the Smoke Shack, across from the Daytona Speedway. Walking inside, the ambiance is basically what you’d expect from a place called Smoke Shack located in a strip mall: they do a pretty good job of setting up a fake “shack” ambiance with wooden walls and decor, with most of the seating being long, table-cloth covered picnic tables. Grabbing a seat and looking over the menu, I quickly settled on what I was craving: meat. And since this was Florida, that means pulled pork. So I ordered up a pulled pork platter with a side of collards (another thing us Yanks aren’t terribly good at) and cole slaw. A few minutes later, my food arrived, and I’ll have to say, this was some enjoyable pulled pork. It had obviously been decently smoked, getting to the point of being fall-apart tender without getting mushy, still moist, and having a rich smoky flavor with little bits of concentrated flavor from the “bark”. Like always, I tried it without any applied sauce, and for the most part, enjoyed it without feeling I needed to sauce it much. Overall, a very enjoyable plate of pork, with a decently executed cole slaw (celery seeds are always a bit controversial in slaw, but I love ’em) and collards. I certainly wouldn’t mind coming back for more. 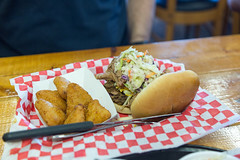 My coworker went a little further afoot on the menu, opting for the pork sandwich topped with slaw (another controversial Southeast thing that I also approve of) and a side of deep-fried mac and cheese, which was also rather enjoyable, little pockets of hot cheesy mac with a crisp exterior. 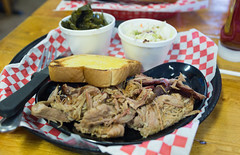 Overall, Smoke Shack was a win: it had been a while since I had a truly good pulled pork, and this fit the bill. I’d happily explore some more of their menu and see if their other meats are good as well.